Today I am honored to be part of A Blog Named Hero's 5th Anniversary Hop. I was lucky enough to be on the very first Design Team that ABNH had. It was one of the best teams I have ever had the privilege to be a part of. I was honored when they asked me to help them celebrate their 5th Birthday. There are some great prizes up for grabs from the following AMAZINGLY GENEROUS companies. Keep reading to find out how to enter. I recently got my order of Distress Oxide inks and I haven't been able to stop playing with them since. So I pulled out some Hero Arts background cling stamps and started playing. I used the Leaf and Floral Background Stamp. which is one of my all time favorites. I don't believe they make it anymore but I did find three available for purchase at Amazon. Click HERE to get yours. If you do a Google search you can find a few other places that have it in stock too. I added some shimmer to it by using my Wink of Stella pen. You could also mist it with some Perfect Pearls if you have that on hand. The sentiment is from the Hero Arts "You're So Kind" set and you can get it HERE at Simon Says Stamp. A Blog Named Hero is so thankful for our wonderful sponsors and collaborating companies! Several companies decided to help us celebrate our fifth anniversary with giveaways and they were so generous that we decided to spread the love over both hop days with different prizes to be won each day! Giveaway prizes total more than $500! To win, leave a comment on each hop stop. We will select winners randomly from different blogs so the more blogs you visit each day, the greater your chances of winning! And be sure to visit A Blog Named Hero on Sunday for the list of Sunday hoppers and prizes! Now it is time for you to head over to the absolutely incredible blog of Pretty Pink Posh. If at anytime you encounter a broken link you can find the full hop list over at A Blog Named Hero. What a beautiful background! My Distress Oxide inks are on the way to me right now so I can't wait to try this - so, so pretty! So pretty. Love those colors. Very pretty. Love those two colors together. Lovely card, have get to play with the new inks, just got them this week! You have tempted me to play tonight and not do my taxes! Your background is just beautiful! I've been holding out on getting the Oxide inks after investing so much money in the regular distress, but they're so pretty and they seem so much more useful! I love the sparkle you added too! Oh no. I keep seeing the oxide inks. I may have to cave! Love your color choices, so pretty! Great background!Thank you for the inspiration! Lovely card, look forward to play with these inks. Such a great background - pretty card. I'm like bing these new oxide inks! LOVE this Michelle. I also used this background when I was playing for my post, just didn't include it in the actual post. Great stamp. Thanks for celebrating with us at A Blog Named Hero! Love the colors of this background. Oh my, such a pretty card, love the colors and texture. Great background! I am looking forward to playing with the Distress Oxide's once I can get my hands on some. Glad to see the oxide inks in action. Great card! Love ideas for background stamps and this one is so pretty. Great card! I bought those oxide ink colors too! Aren't those distress oxides fabulous?! Love that you used them on this gorgeous card. Love your gorgeous card! I am dying to get the oxide Distress inks! I'm so glad you're a part of this blog hop! Love your card - I have this background stamp, I will have to pull it out to show it some love! WOW this is gorgeous!! Two of my favorite colors from the new inks. What a fabulous card you made for this hop. LOVE the background! Thanks for sharing. Love your color combination with your background stamp. Such a pretty card design. I like seeing the paper flower in the card. Like your color choices. That is always difficult for me, choosing colors. Thanks for showcasing the distressed oxide inks on your card. The more I see them in action I appreciate how they work. Card is lovely! Great color match, it is beautiful. Great design - lovely card. Distress oxide inks! Nice. 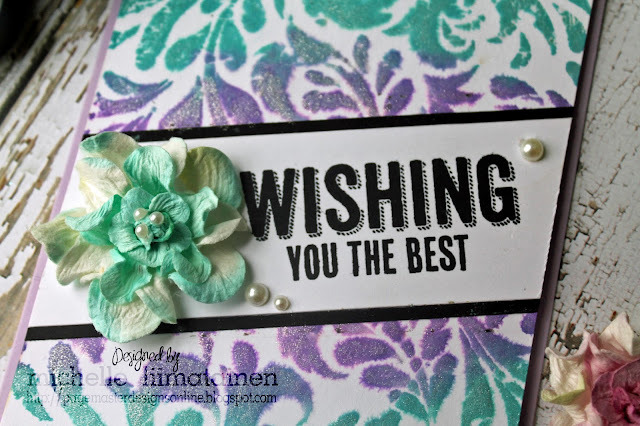 Technology is so wonderful for stampers - we get to see so many new ideas ad beautiful cards like this. Gotta love it. Thanks for sharing your card! Congrats to ABNH on five years. OH my, this is beautiful! I really need to get started using my oxide ink pads! I love those colors and the fabulous stamp! Distress Oxides are my new favorite! Beautiful card. I really like the colour combination you used. You made such a beautiful card with your oxide inks and showed another example of how they can be used. Your card is beautiful. Thank you so much for sharing them with us. Gorgeous use of that stamp and the colors are simply stunning!!! I absolutely love the background on this card. The colors are great. Love your card... the colours, the design...absolutely beautiful! Love the Distress Oxides! Great card! Thanks for the cards using distressed ink! Beautiful card! That background is positively gorgeous! 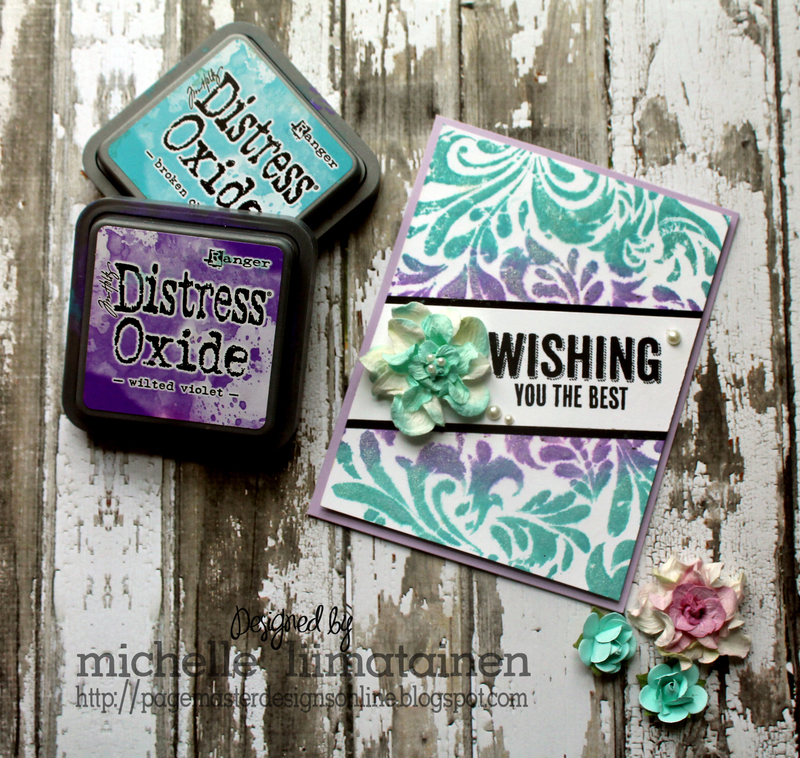 OH I just love the looks of the Distress oxides inks!! I definitely need to get them!! Your card is absolutely gorgeous!! I love the background and the distress oxide inks really make the card! Thanks for sharing your beautiful creation. Love your card and color choices. Distress inks are so fabulous to work with. Love the color combo of the new inks. Lovely card. Love the use of the distressed color Scheme! Great job. Beautiful use of the stencil...love the colour combo. I just love your color choices. Your card is gorgeous. This card is so beautiful! That background you created with that stamp and oxide inks and some sparkle is just stunning. Thanks so much for sharing!! oh- fun colors and love the inks! Love seeing your creations! This design is a wonderful way to use those background stamps while playing with my new Oxides. Thanks! This is softly gorgeous!! Hero Arts and Distress Oxides! Love!!! Gorgeous, absolutely gorgeous!! Love the colors for your background. That flower is the perfect touch too! This is sooo pretty. I love the color combination! I love that background stamp. Great card. I'm a sucker for Distress Oxides. Awesome job on this one!! I love they way you used the new distress oxide inks. Your card looks great. Love the shimmery background! Such a nice card! Very pretty colors, I love them together. Great card. I am waiting on my Oxides - the way you blended those 2 colors is beautiful! I love this! Can't wait to get my oxide inks! Fantastic card! I love those two colours together. Wow.. what a beautiful card.. this is such a pretty color combination! Gorgeous color combo, hoping HA brings back some of their retired stamps, I've seen quite a few retired stamps I would like to have. I so want to get started on the Distress Oxide inks. Your work looks so great. TFS! Like the colors and the distress ink. I am completely in love with the new distress oxide inks. They are at the top of my wishlist. And I love the card. It looks so gorgeous. Especially with that pretty bloom. Lovely card! I love your color choices! Beautiful card! I love the distress oxide inks and have only begun playing with the few pads I've picked up. great card, love the Distress Oxide colors you chose. I just loved your card. I am not ready to try the oxide inks yet as I am trying to organize and make sure that everything has been touched and used at least once. Beautiful colors for a lovely card. Oh, how pretty! Love the pretty flourish background with the pretty colors. The touch of sparkle looks lovely. Great card! and great new inks!! i love it when cards are made using stamps as the background!! it's so creative!! Awesome background! Gonna hafta get me some of those inks! Such a pretty background! I love those colors and the diagonal sentiment strip. Came back to see if I could comment & can and wanted to say that your coloring & creation is wonderful. Your card is beautiful! That combination of colors with the stamp is lovely! Can't wait to get my Distressed Oxides to play too! Beautiful card love the background colors and flower well the whole card. My favorite color combination <3 Awesome card! your purple and blue background is lovely! SOOOO pretty! Glad to see those oxide inks in action!! Awesome card! Love that pretty color combo and the design! Wonderful card! The colors are beautiful! I too love the oxide inks. They are so much fun, and you did a great job with this card. The colors are fantastic, and the paper bloom adds a touch of elegance. I'm addicted to playing with the oxides too, this is lovely! Such a beautiful, happy card. Love the color choices. And your flowers are amazing! TFS! Beautiful! I just received my oxides ink yesterday and can't wait to play. Love the colours you used. Beautiful card! I love the background stamp you used, and I know those Oxide Inks have a lovely matte, chalk-like finish. TFS. Great card. Love those colors! Thank you so much for sharing. Waiting for my oxides to arrive so I can play too. Loved your cars! Love the colors of your card. Such a pretty background! What a pretty color choice. Love the colors using the Distress Oxide inks. Pretty background stamp and color combo! Pretty card. I love purple and green. Great card with beautiful colors. Thanks for sharing. Loving the colors you used! Love the colors! Fabulous card! Love those colors! Nice card! Thanks for tracking the background stamp on Amazon. That was very nice. This is very pretty. The blues and purples are beautiful. Great card, I can't wait to get some Distress Oxide Ink! Love the colors and can't wait to play with the oxide inks. Gorgeous! I still need to get my hjands on those Oxide inks! So pretty! I love the inked background. Thanks for sharing the links. Ooh, I love those colors! What a great background. Thank you for the chance to win! Beautiful background color. Thanks for the inspiration. Awesome card. Love the colors you used. Thank you for sharing your ideas and the link to finding the background stamp. Love your card! I need that stamp! You just made me want to go buy some Distress Oxides! Beautiful background, love the color combo! Love the sentiment on the diagonal. wow, those oxide inks are taking "beautiful" up a notch! Hey Michelle! It has been a while. Welcome back to A Blog Named Hero! We are so happy you came back to celebrate our 5th Anniversary. I Love your colorful card! I love how you created your background and added the sentiment on an angle. I love your background! The more I see people use those oxide inks, the more I want them! Great color combination, love your cards. That background is so awesome! Thank you for sharing this terrific card! Oh I love the look of these Distress Oxides with a background stamp like this. Thanks for the inspiration! Your card is lovely. I can't wait to try my distress oxide inks! Great card! Makes want those new Oxides! Great card! I love the color combination and that flower. So pretty! Love the color combo used in this card. Great card. Great card. Colors I love. Great stamps and inks. Gorgeous card, love those colors together!! I am just starting to play with my Distress Oxide inks and your background is a great inspiration. Beautiful card! Pretty card! My I want some of the distress oxide inks. But since I was made redundant last year there's no shopping for craft supplies for me! Love the use of the Distress Oxides with the Wink of Stella. The subtle wicking of the ink from underneath is such a cool effect. so pretty. Love the stamp and the colours. I would love to try out the distress oxide inks. This looks beautiful! Love the background with the dioxide inks. So smooth. The colors are beautiful. Wonderful card. One day I will be ready to try distressed inks.. not yet. Beautiful! great colour combo and background stamp.